A single bee flying into your car feels fairly apocalyptic and can throw even the most courageous among us into panic and despair. But apparently there are some heroes capable of keeping their cool in situations far more dire, for instance, when 3,000 bees are loose in the cab of a moving vehicle. "Houston, we have a problem!" 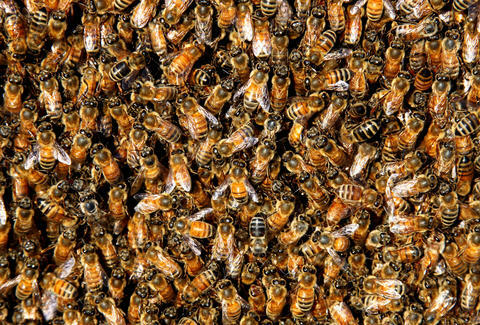 A beekeeper takes a dangerous drive home when some 3,000 bees broke free from their containers in his truck, swarming all over the cab. For an example of that kind of heroism, watch the clip above. In it, North Carolina man Wallace Leatherwood is driving 40 miles from Weaverville to Waynesville, North Carolina with 3,000 bees in the cab of his truck. He'd just bought 18,000 bees from Wild Mountain Bees in Weaverville, placed them in the back of the truck, and ran some errands. At some point, he took three boxes of bees from the bed of the truck and moved them into the cab, aka where he'd be sitting. "I didn't have any shady place to sit them," Leatherwood told Memphis' WREG. "When I came out, [one of the boxes] was black with bees, and there were bees everywhere. I thought, well, I don't know what to do." One option would have been to simply walk away, abandon the truck, and start a new life in a different state. Instead he opted to drive the truck anyway. "I didn't want to lose my bees. They were $165 [per box],” Leatherwood explained. He decided to head over to the car dealership where his son works with "a bunch of scaredy-cats" just to mess with them. The video above was taken on Interstate 40 after he'd visited his son. He drove all 40 miles back home without doing anything to remedy the fact that his truck was literally filled with bees. "It is dangerous. I know what you're going to say. 'Oh, you need to have an EpiPen and you should have a bee suit,'" Leatherwood added. "Well, I don't use a bee suit 99 percent of the time, so I'm just cool with them." Does this seem insane? Sure. But he wasn't stung even once.